Whether you’re over for the Tour Down Under or for any visit, make sure you take your bike because there’s a full program to enjoy of cycling Adelaide and surrounds. 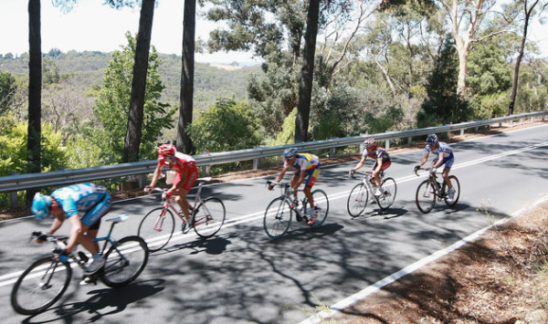 The Adelaide Hills are the favourite training ground for locals seeking strong climbing form. Test yourself on the highest of them all with an ascent of Mt Lofty. The old highway provides a route with less traffic. Try this route. Ride yourself beachside with a circuit from Glenelg to Grange on absolute waterfront paths. Here’s a route mapped from the city. We simply couldn’t miss out on the action — if you’re around Adelaide for the Tour Down Under this weekend, then we’ll see you there. For those who want to take the opportunity to squeeze in some extra training, wave leader Rob Burgess is hosting a training ride. Kicking off at 9:30am, meet outside the Red Berry Cafe 2 L’Estrange St, Glenside. Stop by Bicycle Network’s super rest stop at Henley Square outside the Surf Life Saving Club. We’ll be set up with our buffet table of snacks and refreshments from 6am-12pm. Refuel and refresh once you reach the summit of Mt Lofty. Stop by our super rest stop at the Mt Lofty Plaza (outside the summit restaurant) from 6am-1pm and enjoy the complimentary snacks and refreshments on offer. Wilunga is a legendary name in the Tour Down Under – it’s a fierce hill that tests the pros in the hot conditions to be expected for the race. It’s a great spot for spectating because it slows the racers down enough that you can actually see them! 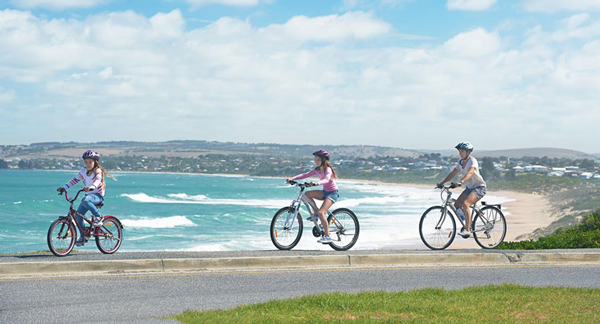 The 34km Coast to Vines Rail Trail stretches from Wilunga through the McLaren Vale wine region all the way to the coast, offering a delectable array of culinary delights along the way. Also visited by the Tour Down Under is the renowned Barossa Valley, home of world-famous wineries and one of Australia’s finest providores, Maggie Beer’s Pheasant Farm. The Barossa Trail traverses the region to connect the main towns of Tanunda and Angaston. It provides 10km of off-road riding as a base for your explorations. Further afield but also offering high quality riding and refreshments is the Clare Valley with its 54km Riesling and Rattler Trail. This was one of the first rail trails to be developed in Australia and remains one of the best for scenery and a quality riding surface. In Adelaide you’re enticingly close to Australia’s mythical red centre – and there’s a trail to take you there. 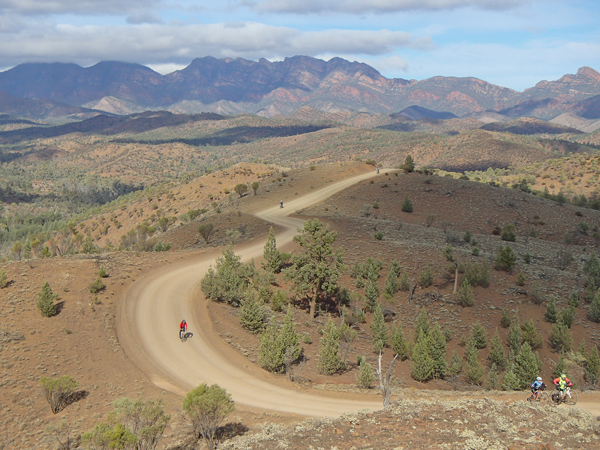 The 900km Mawson Trail extends from Adelaide all the way into the heart of the majestic Flinders Ranges. The trail includes little-used country roads, state forest and national park fire trails, farm access tracks and unmade or unused road reserves, avoiding bitumen roads and traffic with a meandering alignment. You’ll need a mountain bike but then the question is: how far out back do you want to go?